This is my favorite film of 2016! No movie hit me as hard as this one, and as weird and crude as it can get, it never loses sight of the underlying message, which by the way isn't told, but oh so vividly shown throughout. A strong 3.5 out of 4. Unusual, entertaining, and sometimes thoughtful for the first 90% or so. Could be said to be low-brow, but that's a low-brow sort of thing to say in a review and betrays a dismissive perspective that is, at best, already unwilling to experience the thing without unconscious prejudice. I liked it, anyways. Found myself really laughing a couple of times. Eventually you get to the last 10%, at which point the feeling that the script is unravelling and the filmmakers have lost control may begin to set in. I say rest assured this is not the case. Make it through the last 10%. Stick with it. I am writing this 24 hours after seeing it. The whole thing fits together very nicely. I want to give some extra points for daring to take weird creative risks... This movie definitely does that. Unfortunately the result is by turns maudlin, twee, and gross. I can imagine everyone involved reading the script and thinking "wow, that's not something I see every day". On the other hand, maybe there's a reason for that? Other than the premise, there's nothing particularly striking or exciting about this movie -- it's not visually interesting, the dialogue is banal, the soundtrack blandly inoffensive. It turns out, there's more to movie-making than a strikingly original idea. �Swiss Army Man� opens with a shot of an exasperated Hank (Paul Dano) preparing to hang himself on a deserted island. Bored, alone and without hope, a look of astonishment surfaces on Hank�s face as a body (Daniel Radcliffe) washes up on shore before his impending suicide. Desperately searching the body, Hank soon discovers that it is without life and is very flatulent. Through a series of odd and spectacular events, the body comes to life and the two go on a �road trip� of epic proportions to get Hank back home. 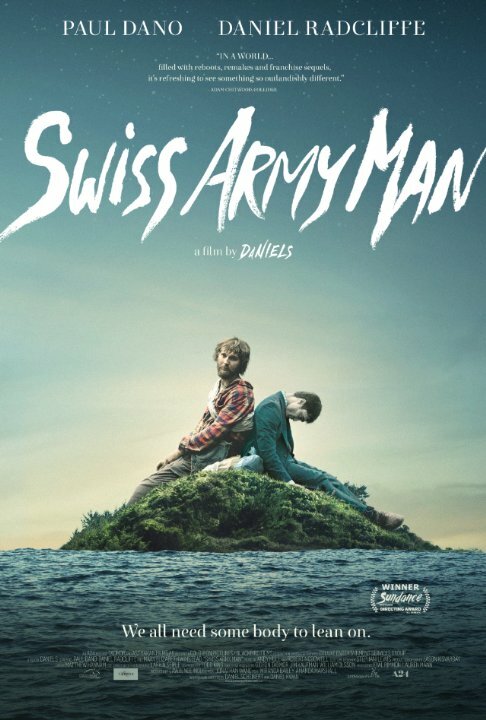 For those who say that originality is dead and that there are too many remakes, reboots and superhero movies out there - by all means, please point them to Swiss Army Man. If you can dig deeper beyond the juvenile humor of flatulence and erections, you will find a film full of heart with a depth not often achieved by many films - and that in itself is reason to watch. "If my best friend hides his farts from me then what else is he hiding from me, and why does that make me feel so alone?" Never would I expect a farting talking corpse would've turn out to be a good movie. Even on paper, this idea sounds awful, but it's one of those things that manages to work out. I always hear people complain that movies just ain't that original anymore, with the endless reboots and the unnecessary squeals. And then you get something like this that's so different. Something so bizarre, weird and original that it's executed in a way that it actually works as a movie. No posts have been made on this movie yet. Be the first to start talking about Swiss Army Man!